Samford University’s board of trustees approved new academic programs and candidates for spring 2017 graduation in their spring meeting May 9. A new Master of Studies in Law is designed for nonlawyer professionals for whom a legal background would be beneficial. The 36-credit hour program will be online, and students can create a course of study customized for their particular needs. A new Bachelor of Science in health information management degree is designed to qualify graduates to sit for the Registered Health Information certificate examination. Students in the program will gain comprehensive knowledge of medical, administrative, ethical and legal requirements, and standards related to health care delivery. Both new degree programs are pending final approval by the university’s accreditation agency, the Southern Association of Colleges and Schools Commission on Colleges. A new post–family nurse practitioner–emergency nurse practitioner certificate program in Ida Moffett School of Nursing will prepare family nurse practitioners with the education and skills necessary to practice in emergency departments or urgent-care clinical facilities. Trustees approved the more than 1,200 candidates for spring graduation. Following their vote, trustees continued their long-standing tradition of pausing to pray for the students as they prepare to graduate. Eight new faculty members were approved in arts, arts and sciences, business, health professions, and libraries. 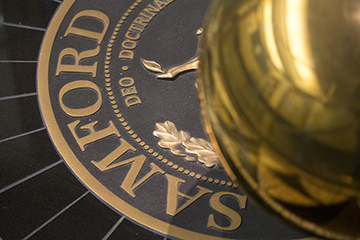 In a series of reports by university administrators, trustees heard that the university is on track to meet enrollment goals for fall 2017, and that $48.8 million already has been given or pledged to the university’s $300 million Forever Samford campaign. As of March 31, the university’s endowment was valued at $285.9 million. The next full meeting of the board is Sept. 8.